Hot Shot’s Secret, manufacturer of a full line of performance enhancing fuel and oil additives, is partnering with NHRDA racer and pro puller, Amalee Mueller, to “Save The Racks.” Mueller, the 2017 Pro Stock Champion in the NHRDA Sled Pulling Series also is an avid bow hunter and outdoorswoman. 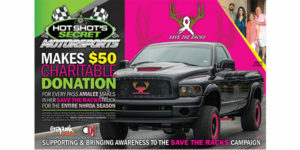 When her mother was diagnosed with breast cancer eight years ago, she branded her Dodge Cummins-powered pull and race trucks with “Save The Racks” to raise awareness and support her mother’s fight against breast cancer. Beginning with the March 16 season opener of the NHRDA Hot Shot’s Secret Diesel Drag Racing Series in Chandler, Arizona, Hot Shot’s Secret is supporting “Save the Racks” by donating $50 for every pass made during the drag racing series, and will provide a $250 bonus for a second place finish or a $500 bonus if Amalee wins the class. Starting the season, Mueller won the 10.90 index class, racking up a donation total of $850 from Hot Shot’s Secret. In addition, Hot Shot’s Secret also will make donations following the same schedule for all passes run by Mueller’s father, Edgar Artecona, to support this worthy cause. All funds collected throughout the season will be donated to the Breast Cancer Research Foundation in October during the NHRDA World Finals, which coincides with Breast Cancer Awareness month. “Save the Racks” T-shirts will be sold at the races in the Hot Shot’s Secret booth with 50 percent of the purchase price to be added to the donation as well. This year, Mueller is unveiling a new “Save the Racks” wrapped Pro Stock truck built by Lavon Miller and the Firepunk Diesel team, D&J Precision and fueled by Exergy Performance, that will be unveiled on May 18-19 at the Oklahoma Diesel Nationals in Tulsa, Oklahoma.